The R-PLEX Human NT-proBNP Antibody Set includes a matched capture and detection antibody pair and calibrator for the quick and easy measurement of NT-proBNP in biological samples. R-PLEX products leverage MSD’s electrochemiluminescence technology for better sensitivity and a larger dynamic range than traditional ELISAs. R-PLEX matched antibody sets enable the development of singleplex and multiplex immunoassays. Individual assays may be developed using MSD avidin- or streptavidin-coated plates. Custom multiplex assays with any combination of R-PLEX analytes, as well as R-PLEX plus U-PLEX analytes, can be developed on U-PLEX MULTI-SPOT plates. To learn more about the advantages of R-PLEX products click here. 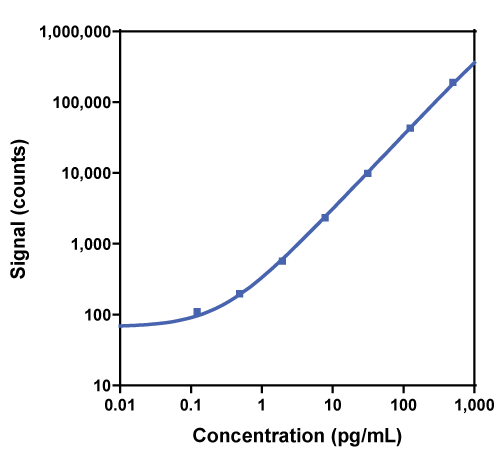 Calibration curve for the R-PLEX Human NT-proBNP Antibody Set was assessed and representative data are presented below. Description - N-Terminal pro-B-type Natriuretic Peptide (NT-proBNP, NPPB, natriuretic peptide B, BNP) is produced by the cardiac ventricular myocytes. NT-proBNP is released in response to volume expansion and filling pressure and is involved in maintaining intravascular volume homeostasis. Proteolytic cleavage of the signal peptide releases pro-BNP. Further proteolysis of pro-BNP generates an active 45 aa BNP molecule. Elevated plasma levels of BNP and NT-proBNP have been observed at times of cardiac damage, making this a useful tool for cardiovascular research.